Welcome to Museum HR Giger. 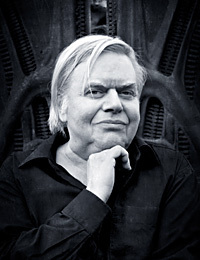 On June 20, 1998, the MUSEUM HR GIGER opened its doors in the medieval Château St. Germain in the 400 year old historic, walled city of Gruyères, Switzerland. As the permanent home to many of Giger's key works, the museum houses the largest and most impressive collection of the artist's paintings and sculptures, furniture and film designs, dating from the early 1960's till the present day. The museum's top floor houses a permanent display of Giger's own private art collection and the Museum Gallery where Giger curates exhibitions on the works of other artists. Click here (link) for latest information about Museum Gallery Exhibitions. Adjacent to the Museum is the fantastic Museum HR Giger Bar. Completed in 2003, HR Giger Bar is a work of art, an original and completely unique experience. The ceiling, walls, floors, fittings, tables and chairs are all modeled by the artist in the style of his acclaimed biomechanical designs. Giger Bar is the ultimate in immersive art.